Bose Speakers are on the cutting edge of speaker technology. Bose could very well be voted as the most popular speaker to use in this day and age. From large speakers to blast sound throughout an entire stadium too small ones used in cars and headphones and wearable speakers, Bose is a brand name you need to know. Watch an NFL game, what sound system do they use? Bose. How about Formula One racing, USSA, Team 261 Fearless (supporting women in the Boston Marathon)? Yep, they all use Bose. For training, for entertainment, for whatever life hands you, Bose is there to help with your sound needs. But which are the best Bose speakers for quality Sound? After all, if Bose is the world's most widely used and popular brand of speaker they can get away with charging a higher price for their products compared to competitors. Therefore, getting the best product for your money is worth researching. Let's look at a few of their stereo speakers and see what the best one out there is. There is still the question of finding just the right speaker for your needs. 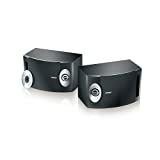 Stereo speakers can be labeled as computer speakers, bookshelf speakers, floor-standing speakers, in-wall or ceiling speakers, or outdoor and marine speakers. Most of which can be connected to play the same or even different music simultaneously throughout a single home, yard, and structure. 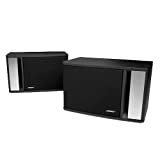 Since we are reviewing all types of Bose speakers, many designed with a specific utility or purpose in mind, the parameters defining judgment are primarily overall sound quality and functionality. 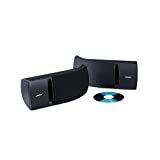 These type of speakers usually sit on either side of a computer or laptop offering more and/or better sound than what the computer itself can put on. Often when you buy a computer, the speakers that come with it are already installed into the device are of lower quality and may not be as loud or clear as the ones that Bose can offer. 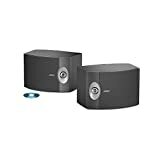 Bose has two speakers that are specifically for use with and for a computer. Designed to provide a clearer and more realistic music or movie or gaming experience. These compact speakers give a lot of sound for such a small speaker. Their unique TrueSpace digital signal processing circuitry produces sounds that are consistently more clear and full at any volume. Sound can become lifelike. 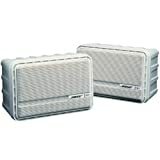 Due to these Bose speakers' ported design, the sound has deeper low performance and more detailed audio. With volume control and headphone jack on the right speaker changing how you listen to the frequencies emitted from these speakers is easily done. These speakers also have an extra auxiliary port to add another device such as your smartphone to your sound system in a flash. Listening to your favorite music, videos, and games just got way better, and this is their most affordable computer system. These speakers, like the Companion 2, have TrueSpace technology that produces that wide, open, and natural sound we all love in our sound systems. It also has a volume control and headphone jack, and the auxiliary input, however, they are not on the right speaker. Instead, this speaker system has a unique control pod for those things, and one-touch mutability and the volume control is rotational. These speakers have an advanced port design and more powerful drivers than the Companion 2 to deliver even more power for low-note performance and clearer sound. Upon hearing these speakers for the first time, many people expect to see a sub-woofer in the room. It is hard to believe that so much high-quality sound can come from two small speakers. Even smaller than computer speakers, bookshelf speakers can be just as powerful. Their size allows them to put just about anywhere and used for many reasons regarding sound within your home or office. You can hardly go wrong with these classic bookshelf speakers. 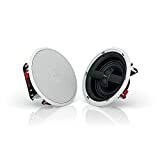 These speakers are component speakers that connect to a stereo receiver with stereo targeting tweeters that are precisely angled to optimize your sound throughout the room and an 8" woofer that expands the sound even more. They have one rear-firing tweeter as well that propels sound from the back and sides of the speakers to give the sound a more balanced and lifelike sense. This way it sounds much more like live performances than just that old song you've listened to thousands of times before. When connected to any other Direct/Reflecting speaker system you get a seamless home theater design that gives you cinema-like sound. These are very similar to their 301 counterparts. These, however, are smaller, providing even more versatility for the listener. These may be more suitable for smaller spaces and rooms due to their smaller size. 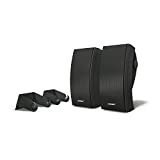 These Bose speakers are used for primary, secondary, or home theater speakers. Like their larger companions, they contain a speaker lens that helps with high frequency and with the 6.5" woofer adds balance to the sound throughout the room. These bookshelf speakers are quite a bit different from the last two. These small speakers can be placed just about anywhere. They even have wall mounts available to optimize space and sound in your home. 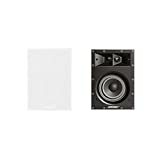 These magnetically shielded speakers have allowed for close proximity to a TV without interfering or interrupting picture quality. A twiddler driver is used to generate more air movement through them creating more sound so they can deliver the sound of a much larger speaker without taking up all that precious space. 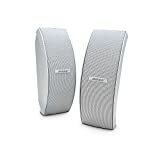 These are one of Bose's best selling speakers. Each of these come with one 7" woofer and two precisely placed 1" tweeters. This allows the elimination to aim the speaker in any certain direction within the room. Like all the other speakers Bose carries it comes equipped with Stereo Everywhere that sends that sound over a wider area than most types of speakers allowing the sound to be more balanced with no-drop offs. The 791 offers a nearly bezel-less edge that allows for seamless integration into your decor. The grills for the speakers can also easily be customized to match the decor of your space. These grills are also magnetic for easy on and off and cleaning. With these, you get the same unmatched sound as their larger counterparts. These are just a tad smaller. Their woofer is 5" and has two 3/4" tweeters. Still made with Bose's exclusive Stereo Everywhere technology to balance sound and send it throughout the room effortlessly. Just like the larger in-wall speakers, these offer excellent sound with unmatched quality in smaller, more compact design. A 5" woofer and two 3/4" tweeters send sound into the space with clear, controlled sound without taking up any extra space no matter where you install them. 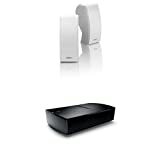 Outdoor and Marine speakers from Bose allow you to take your music, games, and even movies on the go with you. They are perfect for that backyard party you have been wanting to host or for just chilling out by the pool playing your favorite tunes in the sun. Bose speakers are known to be created with excellence but they are also made to withstand some serious adversity. Whether it's rain, snow, salt or extreme temperatures these guys are made to handle it with ease to keep providing you the best sound can offer in the great outdoors. These are wall-mounted speakers that can be attached to your exterior walls and connect to your stereo component. The speaker cabinet was designed with your yard in mind to reproduce low frequencies with minimal to no distortion. With two 2.5" drivers and one 5.25" woofer, these Bose speakers produce a big sound to fill your outdoor space with no "sweet spots." SoundTouch Outdoor Wireless System With 251 Speakers. This sound system offers you the availability to listen to your favorite music outdoors, whether it's on your phone, your tablet or your computer. You can wirelessly connect all your favorite devices to play music anywhere. Wherever you choose to house your music library, play it all outside. This is an amplifier that connects the speakers we just talked about, to Bluetooth so you can play your Pandora, Spotify, Sirius, or similar programs. These are the most popular of Bose's outdoor speakers. They are just as durable as the 251 speakers but smaller, which makes them a great addition to any boat. They sport three 2.5" drivers to give tons of clear sound anywhere possible. They come with weather resistant mounting brackets for easy mounting of the speakers to exterior walls or onto boat platforms and walls either horizontally or vertically. Once again this amazing wireless technology comes into play to pair with these great outdoor speakers. Out for a ride/drive on the boat and want to listen to music? No problem. Simply connect to your Bluetooth device and listen until your heart is content. Have a space outdoors where wall mounting isn't an option? Or maybe you just want to make sure sound is reaching every corner of the yard. Here is a small solution. 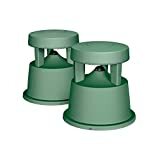 These little guys are engineered to withstand all the extreme weather like the other outdoor speakers, but these can be placed on the ground and even withstand up to 350lbs of pressure. With a centrally located port and domed port grill, this Bose speaker will provide 360-degree sound coverage all while seamlessly blending into the greenery of the outdoors. Which one has the best sound quality? Let's go ahead and omit the outdoor and marine speakers first. They are great speakers with amazing capabilities, especially given the elements they have to withstand. However, we all know when you are outdoors things happen, and there are sounds that most speakers can not combat with. Then we should cut out the computer speakers. If we are going for the all-around best quality of the speaker, then we must give all of its capabilities space. 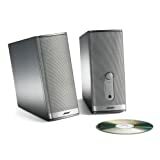 Computer speakers are just that, computer speakers and therefore, are limited to what they can attach to. The in-wall and in-ceiling speakers are elegant and blend anywhere and with anything. However, they have priced a lot higher than the bookshelf speakers that can produce sounds that can easily compare. Sure the in-wall speakers have larger woofers and therefore can produce more sound. But for most spaces within a home or office speakers need not be so large. Based on the reviews on Bose's website and the qualifications of the bookshelf speakers, we would say these little guys can do the job nicely without a lot of extra work for installation. If you are just building a home or space or remodeling and planning on putting in-wall or ceiling speakers in, then look into that option. For most, we would like to optimize what we already have and don't want to have to make cuts in walls or ceilings to do so. We would put the 301 Direct/Reflecting speaker system into any home. These speakers come in a pair and are the largest of the bookshelf speakers. 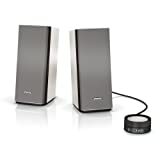 They can be placed just about anywhere and connected to anything to subject your home or office with the best sounds. The woofers and tweeters on these are large enough to carry sound, balanced and crisp, throughout any space. They can connect with any other Direct/Reflecting system to become even better. They are the best Bose speakers to buy.